The recipe for this easy dinner calls for ground turkey; I substituted leftover roast turkey. I also sprinkled half a thinly sliced red onion on the corn mush just before broiling. To finish the Mexican theme, serve with a crunchy slaw flavored with chopped cilantro and small strips of jicama. Adjust oven rack to middle position and turn on broiler. Heat a large deep skillet with an ovenproof handle over medium-high heat. Cook turkey, stirring frequently and seasoning lightly with 1 teaspoon salt, until it loses its raw color, a couple of minutes. Stir in 2 tablespoons chili powder, then beans, chiles, olives, salsa and 1/4 cup cilantro, and simmer about 5 minutes. Meanwhile, bring 3 cups water, cornmeal, remaining 2 teaspoons chili powder, and 1 teaspoon salt to a boil in a medium saucepan, whisking frequently, until mixture thickens to mush. Pour mush over meat, spreading to cover. Sprinkle with cheese and remaining 1/4 cup cilantro. Broil until cheese melts and mush gets a little crusty, about 5 minutes. Let rest for 5 minutes before serving. It’s apple season, but alas, one can eat only so many desserts. This recipe transforms fall’s favorite fruit into a hearty main dish. I used sweet-sour Jonagolds, but any large baking apple will do. Be careful not to scoop too much of the flesh out when hollowing the apple. To serve as a side dish, cut the apples in half after baking, and drizzle with a little maple syrup. Pull the bread into large pieces and place in a bowl. Pour in milk and let stand while you prepare the apples. Cut a 1/2-inch slice off the stem end of each apple. With a melon baller or grapefruit spoon, scoop the core from each apple, being careful not to pierce the blossom end. Continue to scoop the apple flesh to form a hollow cavity with sturdy sides. Rub cavities with lemon juice. Squeeze as much milk as possible from bread, place in a bowl and add sausage, cheese, egg and parsley. Mix well, then season with salt and pepper and mix again. Spoon sausage mixture into the apple cavities, mounding the tops. 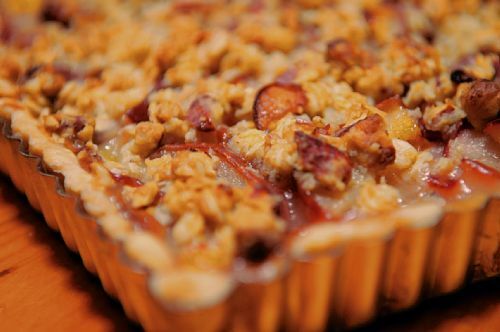 Place the apples in a baking dish large enough to hold them in a single layer. Pour water into the dish to a depth of about 1/4 inch. 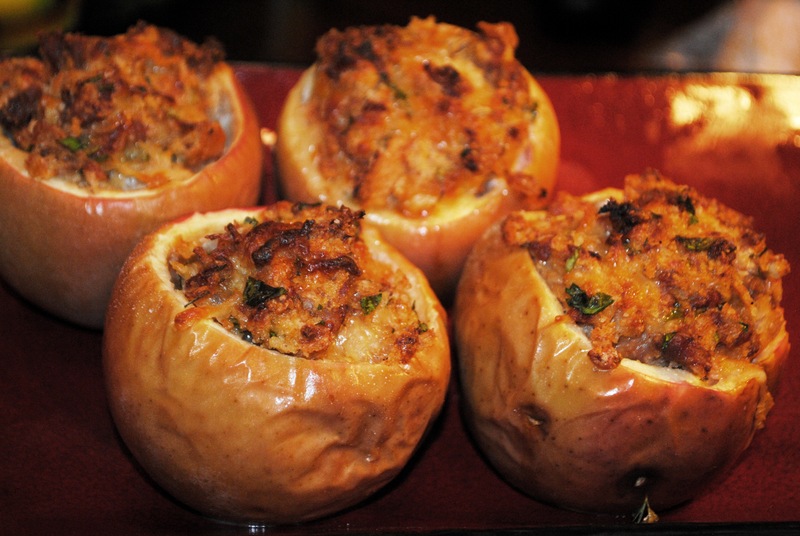 Bake for about 45 minutes, or until the apples are tender when pierced with a sharp knife. Serve immediately. By the time my hip pushed open my parents’ back door just after sundown, the 14-pound turkey I’d just finished roasting sliding precariously on the rimmed cookie sheet I held in my hands, their kitchen was standing-room-only. 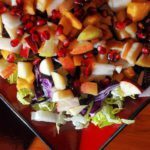 Bob was bent over the sink, hurriedly cubing apples, pears and persimmons for a colorful fall salad of shredded cabbage, romaine hearts and pomegranate. Michael was circling the room in search of olive oil for sauteeing a pan of roasted Brussels sprouts and chopped shallots. And oh, did anyone have a large spoon he could use or know where Mrs. Trent kept the salt? Marlene was wondering aloud where the wine glasses might be stashed — surely, someone remembered to bring wine! — while China and Patricia conferred in front of the stove. How best to rearrange the oven racks to accommodate the half-dozen or so dishes piled up on the breakfast room table that needed to be warmed before serving? Especially since there was a second turkey still in the oven — this one brined, for a little variety on our Thanksgiving table — that stubbornly refused to brown? And me? In my rush to get out the door, I’d forgotten on my kitchen counter a container of turkey stock Patricia had promised to whisk into a delicious gravy. And a bunch of parsley for the turkey platter. Along with non-alcoholic beverages for the starving teenagers cooling their heels in the living room. Pushing aside a casserole dish of mashed potatoes to make room for the turkey, I shot my husband a look. He fished the car keys out of his pocket with a sigh and headed for the door. In other words, it was like any and every other Thanksgiving gathering I’ve ever known: the controlled chaos of too many cooks in the kitchen, too much darn-good food to fit on the table and too long a wait for it to get there. Except that this was a Thanksgiving on Oct. 28 — a month early recipe-testing run by the Food & Flavor folks, their families and some friends. Originally planned for a lovely Laurel Highlands lodge, the event was bravely hosted by my very brave and generous parents at their big Ben Avon home. I was luckier than most in that I wouldn’t have to go far to get to Grandma’s: I live around the block from the house on the hill that I grew up in. Yet the rest of my food family — like most people who celebrate the national holiday with a big group of relatives or friends — would have to drive a few (or many) miles with casserole dishes and baking pans perched on their car floors and front seats. We wanted to make sure, then, that the make-ahead recipes that sounded so delicious on paper would travel well. They’d also need to be easy to reheat and serve a crowd, as it’s not Thanksgiving without plenty of leftovers. Thanksgiving also wouldn’t be Thanksgiving without the traditional dishes of roast turkey, cranberry sauce, stuffing and mashed potatoes. The recipes that ended up on my parents’ dining room table, then, were mostly familiar ones — but with a twist, to keep the meal from being boring. For an appetizer, for example, I cooked fresh cranberries with strawberry jam and then spread the mixture on top of a shortbread tart studded with gorgonzola. Patricia’s bread stuffing was moistened with . . . chicken wings. Rather than simply mash or roast butternut squash like the Pilgrims, Marlene baked it into a savory bread pudding. For dessert, homemade pear pie was served with a local chef’s recipe for a caramel glaze flavored with miso. We also enjoyed a fabulous “slab” pie made with quince, a fruit that looks like a cross between a giant, fuzzy apple and a pear. Can you say seconds? So good was the food and fellowship enjoyed by all, that despite the stress of pulling together a meal for 20-plus with close to 20 dishes, it didn’t feel like work. “What time are you coming next week?” my dad asked as the last of the guests headed out the door. 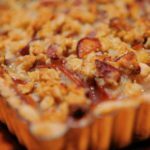 We served this luscious tart as an appetizer, but it would work just as well as a side dish or even dessert. Don’t worry if you don’t have any cherry liqueur — I left it out of the recipe and it still tasted great. I also used a fluted tart pan instead of a springform pan to great success. In a food processor, combine flour, walnut meal, 1/3 cup sugar, salt and sage. Pulse to incorporate. Add butter. Pulse to form a coarse meal, 30 seconds. With your fingers, press meal into an ungreased 10-inch springform pan. Bake until light golden-brown, about 55 minutes. Cool completely and release from springform pan. In a small saucepan over medium-low heat, cook cherry preserves until melted. Add cranberries, remaining 1/3 cup sugar, and cherry liqueur. Simmer, stirring occasionally, until cranberries have lost their shape, about 25 minutes. Remove from heat and cool completely, about 1 hour. Crumble gorgonzola over tart crust in an even layer. Top with a thin layer of cranberry mixture. Divide into 10 even slices and serve. The cook always likes to have one easy dish at Thanksgiving. This is it. Using a hand mixer rather than food processor worked just fine. Prick potatoes all over with a fork. Place on a rimmed baking sheet. Bake until very tender when pierced with a knife, about 1 hour. When cool enough to handle, halve sweet potatoes. With a spoon, scoop out flesh (discard skins) and transfer to a food processor. Add melted butter and maple syrup; process until smooth. Season with salt and pepper. Serve warm. To store, refrigerate in an airtight container up to 2 days. Reheat gently for 10 minutes. This salad is beautiful and delicious and slightly fancy, thanks to the persimmons (available through November) and the pomegranates. You also could add dried cranberries or sliced grapes. For traveling, you could cut up the cabbage and romaine ahead of time, and prepare the pomegranate seeds (arils), and make the dressing, but don’t cut the fruit or dress it until just before serving. Place the cabbage and romaine in a large bowl and toss to combine. Just before serving, add the apples, pears and persimmons to the cabbage-romaine mixture and toss to combine. Add half of the Apple Cider Vinaigrette and toss again, adding more dressing as desired. 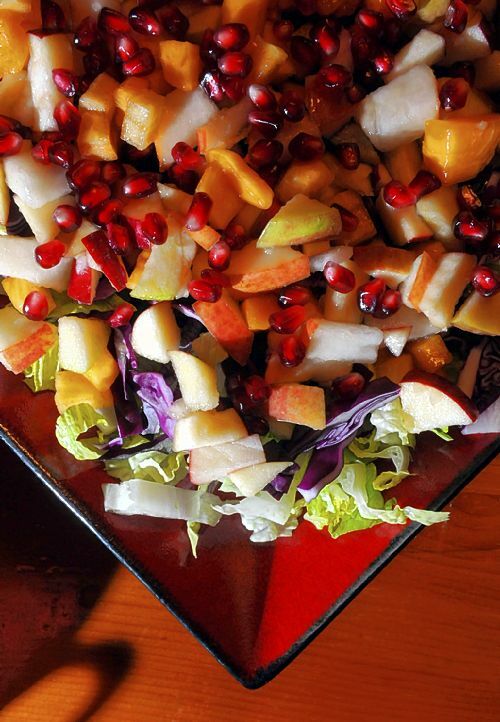 Transfer the salad to a large platter and garnish with the pomegranate seeds, if using, and the mint. Serve immediately. Serves 6 to 8 as a side. You could make this sweeter with an extra tablespoon of brown sugar, honey or agave syrup. This sauce is almost as easy as opening a can of the jellied stuff, and so much better! Put all ingredients together in a sauce pot and cover. Bring to a simmer for about 5 minutes or until cranberries burst open and all are soft. Pulse in a food processor or blender, being careful not to puree (it should be slightly chunky). Cool. This recipe — sort of a cross between a Taste of Home recipe and a recipe my grandmother used to use — is about a million calories, but everyone loves it, and it’s good for making ahead: I’ve toted these potatoes from Ohio to Pennsylvania. You can just toss them in the pan, leave them unbaked and refrigerate until you actually want to bake them. If possible, remove from the fridge for awhile to bring them closer to room temp before baking. Place potatoes in a large saucepan; cover with water. Cover and bring to a boil. Cook for 20 to 25 minutes or until very tender; drain well. Meanwhile, place onions and butter in a small bowl and microwave until onions are soft and translucent, stopping to stir occasionally to redistribute butter. Set aside. In a large mixing bowl, mash drained potatoes. Add cream cheese, cheddar cheese, sour cream, egg, salt, pepper and cooked onions; beat with mixer until fluffy. Transfer to a greased 2-quart baking dish. Cover and bake at 350 degrees for 40-45 minutes or until heated through. Topping the stuffing with turkey or chicken wings while baking gives it a meaty flavor most outside-the-bird stuffings lack. To use chicken wings, as I did, separate them into 2 sections and poke each segment 4 or 5 times. Also, increase the amount of broth to 3 cups, reduce the amount of butter to 2 tablespoons, and cook the stuffing for only 60 minutes. You can use the wing meat to make soup. Reheat stuffing in a low oven to keep moist. Adjust oven racks to upper-middle and lower-middle positions and heat oven to 250 degrees. Spread bread cubes in even layer on 2 rimmed baking sheets. Bake until edges have dried but centers are slightly moist (cubes should yield to pressure), 45 to 60 minutes, stirring several times during baking. (Bread can be toasted up to 1 day in advance.) Transfer to large bowl and increase oven temperature to 375 degrees. Use tip of paring knife to poke 10 to 15 holes in each wing segment. Heat oil in 12-inch skillet over medium-high heat until it begins to shimmer. Add wings in single layer and cook until golden brown, 4 to 6 minutes. Flip wings and continue to cook until golden brown on second side, 4 to 6 minutes longer. Transfer wings to medium bowl and set aside. Return skillet to medium-high heat and add sausage; cook, breaking sausage into 1/2-inch pieces with wooden spoon, until browned, 5 to 7 minutes. Transfer sausage to paper towel-lined plate, leaving rendered fat in skillet. Heat butter with rendered fat in skillet over medium heat. When foaming subsides, add onion, celery, and 1/2 teaspoon salt. Cook, stirring occasionally, until vegetables are softened but not browned, 7 to 9 minutes. Add thyme, sage, and pepper; cook until fragrant, about 30 seconds. Add 1 cup broth and bring to simmer, using wooden spoon to scrape browned bits from bottom of pan. Add vegetable mixture to bowl with dried bread and toss to combine. Grease 13-by-9-inch baking dish with butter. In medium bowl, whisk eggs, remaining 1 1/2 cups broth, remaining 1 1/2 teaspoons salt, and any accumulated juices from wings until combined. Add egg/broth mixture, cherries, pecans, and sausage to bread mixture and gently toss to combine; transfer to greased baking dish. Arrange wings on top of stuffing, cover tightly with aluminum foil, and place baking dish on rimmed baking sheet. Bake on lower-middle rack until thickest part of wings registers 175 degrees on instant-read thermometer, 60 to 75 minutes. Remove foil and transfer wings to dinner plate to reserve for another use. Using fork, gently fluff stuffing. Let rest 5 minutes before serving. Who needs turkey? This savory bread pudding from Bon Appetit is so impressive and delicious it can be the centerpiece of a vegetarian feast or an ideal brunch dish. Recipe developer Molly Wizenberg says: “The custard-soaked bread gets soft and chewy, the sweet squash is balanced by tangy cheese, and the kale tastes wintry and rich.” It’s a great match to cranberry sauce, green beans and other traditional sides. To simplify the preparation, roast the squash, chop the shallots and grate the cheese a day in advance. Preheat oven to 400 degrees. Toss squash with 1 tablespoon oil on rimmed baking sheet. Sprinkle with coarse salt; bake until squash is tender, turning with spatula occasionally, 20 to 25 minutes. Whisk eggs in a large bowl. Add half and half, wine, mustard, and 11/2 teaspoons coarse salt. Whisk to blend. Add baguette pieces; fold gently into egg mixture. Let soak 30 minutes, stirring occasionally. Meanwhile, heat 2 tablespoons oil in a large pot over medium-high heat. Add shallots and saute until soft, stirring frequently, about 5 minutes. Add kale; cover and cook 2 minutes. Uncover and stir until kale is wilted but still bright green, about 5 minutes (kale will be a bit crunchy). Using a slotted spoon, transfer half of bread from egg mixture to prepared baking dish, arranging to cover most of the dish. Spoon half of kale over bread. Spoon half of squash over bread and kale; sprinkle with half of cheese. Repeat with remaining bread, kale, squash and cheese. Pour remaining egg mixture evenly over bread pudding. Cover bread pudding with foil. Bake 20 minutes. Remove foil, bake uncovered until custard is set and bread feels springy to the touch, about 20 minutes longer. Preheat broiler; broil pudding until cheese browns slightly, about 2 minutes. Cool 5 minutes or so, and serve. 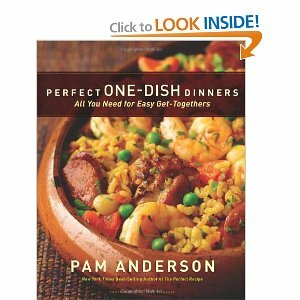 Makes 8 or more servings, depending on the amount of other dishes on the menu. Nothing says “Thanksgiving” like the smell of roasting turkey. This recipe from Lidia Bastianich looks long but is actually very easy. I opted not to finish the bird with a balsamic glaze as suggested (too busy with side dishes!) and used the pan sauce to flavor a gravy. Leftovers were served the next day a la king over biscuits. Arrange a rack low in the oven. Preheat the oven to 375 degrees. Set the wire roasting rack in the pan and the turkey on the rack with the neck and giblets in the pan bottom. Sprinkle 2 teaspoons of the kosher salt inside the main turkey cavity and the rest of the salt (11/2 tablespoons in all) over the outside of the bird. Pour 1/4 cup olive oil on the turkey, a bit at a time, and spread it with your hands to coat the entire skin, including the back. Twist the tip joint of each wing down and forcefully fold it so it stays in place under the neck (think of placing both your hands behind your neck). Rest the oiled turkey on the rack, flat on its back, wings folded and breast up. Toss together in a bowl the vegetables and seasonings, except the salt, with the remaining 1/4 cup olive oil, mixing everything well. If using an unsalted stock, mix 1 teaspoon kosher salt with the vegetables. Put a handful or 2 of mixed vegetables (and one of the rosemary branches) loosely into the cavity of the turkey. Spread all the rest in one layer in the pan bottom, all around the turkey. Push the vegetable pieces under the rack, if your pan is small, so they will cook in the stock. Before pouring in the broth, move your pan near the oven, so you won’t have far to carry it. Pour the broth into roasting pan on the side, without wetting the turkey. Depending on pan size, you’ll need 4 to 6 cups of stock to fill the bottom about 1/3-inch deep. Add more stock (or water) if necessary. Tear two long sheets of aluminum foil. Tent the turkey by covering one side of the pan with the first sheet, arching it well above the turkey. Crimp the foil against the rim of the pan so it stays in place without touching bird. Cover rest of pan and turkey with second sheet of foil (or more if needed), overlapping the sheets several inches. Press bottom of foil tightly against sides of pan, all around, sealing the tent completely. Carefully place the covered pan on the oven rack and push it well to the back of the oven for maximum heat. Let the turkey roast undisturbed for 2 hours. Open the oven, pull roasting pan to the front and lift off the foil sheets. The pan juices should be bubbling away and the steaming turkey will be mostly pale. 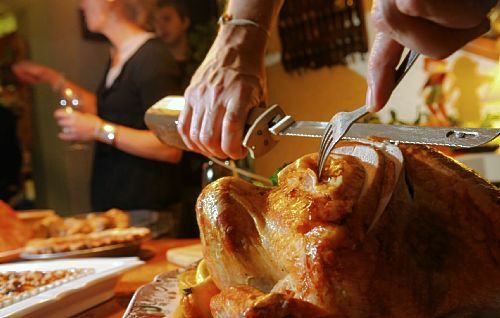 With a ladle or bulb baster, baste turkey all over with pan juices and return it to the oven. Save the foil. Roast the turkey uncovered for 30 minutes to an hour, to brown skin and cook meat to a safe internal temperature. After 30 minutes, baste again and check internal temperature; continue roasting, if necessary, until the meat reaches 160 degrees. If the breast is getting too dark, cover it loosely with a sheet of foil. Carefully remove the roasting pan and lift the turkey out of the pan and onto the baking sheet. Cover the turkey loosely with the foil and keep it in a warm place while you make the sauce. Remove turkey neck and giblets (not liver) from roasting pan to the saucepan. With a potato masher, crush the cooked vegetables in the roasting juices, breaking them into little bits. Set the sieve on the saucepan and pour everything out of the roaster into the sieve, scraping up all the juices, vegetables, liver, and flavorful caramelized bits. Press vegetables and other solids against the sieve with a spoon to release their liquid and discard what’s left in sieve. To finish the sauce, pour into the boiling sauce any turkey juices that accumulated in the baking sheet. When the sauce has reduced almost by half, taste it for salt and add a bit more if you like. Remove the turkey neck and giblets and bring back to a simmer. Strain again, this time through a fine-meshed sieve into a measuring cup or other narrow container. Let it rest for a minute, then spoon off the fat layer that’s accumulated on top. Thicken the sauce with bread crumbs if too liquid. To serve, slice meat and arrange all the pieces on a serving platter. Pour any juices left in the pan or on the cutting board over the meat, and then nap all the pieces with a cup or more of the finished sauce. Bring the platter to the table and let people serve themselves. Put the rest of the sauce in a bowl and pass it. When my husband was in high school and college, he spent a number of Christmas Eves at a friend’s home in Oakland, Calif. Every year, Donna Smith-Harrison — the friend’s mother — served a whole roast goose and a crown rib roast with a number of impressive accompaniments, including this sweet and sour onion relish adapted from a Gourmet recipe. A few years ago, she gave us the recipe and he started making it on Thanksgiving, as an addition to the cranberry sauce. I like to eat the leftovers for breakfast over polenta. Heat butter and 1 tablespoon olive oil in large skillet (I use cast iron) over medium-high heat. When foam subsides, add enough onions to fit in one layer without crowding. Saute shaking pan frequently, until onions are browned on all sides, 10 to 15 minutes. Remove with a slotted spoon to a bowl and set aside. Saute remaining onions till browned, adding more butter and oil as necessary. In large nonreactive saucepan combine water, wine, vinegar, sugar, currants, tomato, 1/3 cup olive oil, bay leaves, thyme, salt, pepper and cayenne. Heat over medium heat until boiling. Transfer browned onions to boiling liquid. Increase heat to medium-high. Cook uncovered, stirring occasionally for 15 minutes. Reduce heat to medium-low and simmer, uncovered, until mixture has the texture of a slightly runny chutney, 45 to 50 minutes. Meanwhile, heat oven to 350 degrees. Spread almonds in a cast iron pan and toast in oven, shaking pan occasionally until browned, 8 to 10 minutes. Remove from oven and let cool. Add mushrooms to onions and simmer until mushrooms are soft, 5 to 8 minutes. Remove from heat. Transfer to a warmed serving dish. Garnish with almonds and parsley and serve immediately. Can be made ahead and reheated. Golden chanterelle mushrooms, white wine and cream transformed these simple sprouts into a dish worthy of the fanciest Thanksgiving table. I’d recommend adding half the cream to start, then adding more to taste. Position a rack in the center of the oven and heat the oven to 450 degrees. Put the Brussels sprouts on a rimmed baking sheet and drizzle with 3 tablespoons of the olive oil; toss to coat. Spread the sprouts in an even layer and season generously with salt. Roast until tender and browned, but not quite done, about 25 minutes. Remove from the oven and set aside. Set the skillet over medium-high heat and add remaining 1 tablespoon olive oil and 1 tablespoon butter. When butter has melted, add the shallot, season with a pinch of salt and cook, stirring occasionally, until tender and golden, 3 to 4 minutes. Add the wine and cook until reduced by half, about 1 minute. Return mushrooms to the pan and add Brussels sprouts and cream. Stir in a few grinds of pepper and continue to cook, stirring occasionally, until the cream thickens and coats vegetables, 3 to 4 minutes. Season to taste with salt and pepper. 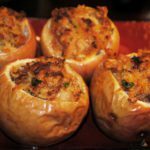 Serve immediately or keep warm, covered, in a 200-degree oven for up to 30 minutes. This is a delicious dessert, full of juicy chunks of ripe pear topped with a crumble of buttery oatmeal crumbs and almonds. It’s similar to apple pie in flavor and texture, but not so tart. Leave the peel on the pears for best texture and color contrast. Make it now when pears are at their peak of flavor. Preheat oven to 375 degrees. In a medium bowl, combine pears, lemon juice, sugar, cornstarch and cinnamon. Set aside to let juices form. Prepare pastry for a 9-inch pie shell. Transfer filling into pie shell and dot with butter. Bake at 375 degrees for 10 minutes. Meanwhile prepare topping. With a fork, mix oats, flour, melted butter, sugar, and almonds until well combined. Remove pie from oven, sprinkle topping evenly over pear filling, then return the pie to the oven and continue baking for one hour. Remove to a rack to cool. Serve warm or at room temperature. This is a classic butterscotch sundae sauce, delectable on cake, pudding or right off the spoon. For a killer combo, stir in miso paste, starting with 2 tablespoons, then adding to taste. The sauce is best served warm, but not hot. In a medium saucepan, combine sugar, corn syrup, butter and salt. Cook over low heat, stirring constantly, until sugar is dissolved. Increase heat to medium-high and bring to a boil. Remove from heat. Carefully and very slowly stir in cream. Be careful not to let it spatter. Continue stirring until the mixture is smooth and foaming subsides. Remove the sauce from the heat. Place the miso in a small dish. Add some sauce to the miso and stir to combine. Add back the miso-sauce to the saucepan and stir to combine. The sauce will separate upon standing. Just give it good stir or shake before serving. Serve warm or at room temperature. Sauce will keep covered and refrigerated for up to one week. But I bet it won’t last that long. These velvety custards taste exactly like pumpkin pie, only without the crust. Serve with a dollop of whipped cream, or sprinkle raw sugar on top and torch, brulee-style, until crisp. If you make them in advance, be sure to cover the custards with plastic wrap to prevent a skin from forming. Bring 1 quart of water to a boil. Set eight 6-ounce ramekins in a large roasting pan, or two small pans. Adjust oven rack to lower-middle position and heat oven to 325 degrees. Heat pumpkin, ginger and cinnamon in a medium saucepan over medium heat until puree sputters and flavors intensify. Whisk in brown sugar, then evaporated milk, and bring to a simmer. Meanwhile, whisk egg and yolks into a medium bowl. Gradually whisk hot-pumpkin mixture into eggs, then pour into custard cups. Set pans in oven and carefully pour in enough water to come halfway up sides of cups. Bake until custards set, about 30 minutes. Remove custard cups from baking dish and cool slightly. Chill until ready to serve. My family discovered brining a few years ago and, thrilled with the juicy, tender results, have never looked back. This year, we opted to go a little fruity with a citrus brine my husband, a salt lover if there ever was one, found on a recipe website. I tucked the fruit back into the bird cavity before roasting, but you also could use traditional stuffing. A brined turkey will release salty pan juices, so if you’re using the liquid to make gravy, be sure to taste before adding any additional seasonings. Rub salt onto your turkey, and place remaining salt, lemond, oranges, onion, garlic, bay leaves, thyme and pepper into a large pot (we use a new 5-gallon plastic bucket from The Home Depot). Place the turkey in the pot, and fill with water. Refrigerate overnight. Discard brine after removing turkey. Place turkey, breast side up, in a roasting pan, tucking wings under the breast. Roast the turkey in a preheated 325-degree oven for two hours. During this time, baste the legs and back twice with 2 tablespoons melted unsalted butter and pan juices. Cover loosely with foil to prevent overcooking, and continue roasting until internal temperature reaches 165 degrees in the deepest part of the thigh. Let turkey rest for 15 to 20 minutes before carving. Cappellacci are small stuffed dumplings, similar to ravioli. In Northern Italy, a typical fall filling is roasted zucca, or squash, seasoned with cheese and spices. This recipe from Lidia Bastianich (it’s on the menu at Lidia’s Pittsburgh) includes crushed amaretti, an Italian almond-flavored macaroon. The butter-sage sauce is simple, but oh so delicious. Heat the oven to 400 degrees and arrange a rack in the center. Slice the squash lengthwise in half, and then quarters; scoop out and discard seeds. Arrange the wedges, peel side down, on the baking sheet, drizzle with olive oil and season with 11?2 teaspoons of the salt. Tent the squash with aluminum foil, place the sheet in the oven, and bake 45 minutes, or until the squash flesh is very soft. Meanwhile, grind the amaretti cookies in a food processor into a fine-textured powder. Let the squash cool, then scoop all the flesh from the skin and heap it on a towel or cheesecloth. Squeeze to remove liquid. When you’ve pressed out all the moisture you can, turn the wrung-out squash into a large bowl, and stir and mash it up with a large wooden spoon. Add the ground amaretti, the remaining 1?2 teaspoon salt, the grated cheese, nutmeg, and lemon zest, and stir them into the squash. Pour in the beaten eggs, and stir until thoroughly blended and smooth. To make cappellacci, cut the dough in 6 equal pieces and roll them out on a lightly floured board. With a round cutter, cut as many 21?2-inch circles as you can from each dough strip, pressing firmly and occasionally dipping the sharp edge of the cutter in flour so it doesn’t stick. Separate the circles, pulling away the scraps of dough (which can be kneaded together, rested and rerolled for more pasta). You should get about two dozen circles from the strip. Place a heaping teaspoon of squash filling in the center of each dough circle. With a pastry brush (or your fingertip) dipped in water, lightly moisten the rim of dough around the filling. To form the cappellacci, pick up a circle and fold it over into a half-round envelope, with the filling inside. Press the moistened edges of dough together to seal, then twist corners inward so the points of dough overlap, and pinch them together. Arrange cappellacci on a lined and floured tray. Freeze cappellacci for future use right on the trays until solid, then transfer them to freezer bags, packed airtight and sealed. Fill a large pasta pot with well-salted water, and bring to the boil. Meanwhile, put the butter and sage leaves in a large skillet or saute pan (at least 12 inches in diameter), and melt butter over low heat; keep the sauce warm – but not cooking – so the herb infuses the butter. Drop all the cappellacci into the rapidly boiling water, stir, and return to the boil over high heat. Cook for 3 minutes or longer, until the thickest part of the pasta is cooked through. Lift out cappellacci, drain, and lay them in the pan of sage butter. Tumble the cappellacci over and over until all are coated; add a few tablespoons of pasta cooking water to extend the sauce if necessary. Sprinkle a cup or so of grated cheese over the cappellacci, and spoon them into warm bowls. Drizzle a bit of the sage butter left in the pan over each portion, and serve immediately, with more cheese at the table. Serves 8 to 10 as a side dish. I was thrilled to discover a pecan pie recipe that did not call for corn syrup, and even more so when I tasted the flavorful custard made from maple syrup, dates, butter and egg. Be sure to buy a few extra dates for nibbling while you bake. The night before you bake, soak the pecans in salted water to cover (two tablespoons of salt are sufficient). The next morning, preheat the oven to 200 degrees. Drain the pecans and spread them evenly on a baking sheet. Toast until dry, not scorched. Alternatively, don’t soak the pecans, just toast them for several minutes. They just won’t be as smooth or buttery. Prepare a 9-inch single pie shell and preheat the oven to 350 degrees. In a medium, heavy saucepan, combine the butter, maple syrup, a pinch of salt and the dates, pinched into pieces or chopped. Bring to a simmer over medium heat, whisking intermittently. Remove from heat, let cool slightly, and whisk in the eggs and either the vanilla or bourbon. Crumble the nuts into the pie shell. Pour in the filling. Bake until slightly risen and set, but not too firm, about 30 minutes. Let cool for a while before eating. So reads a recipe from Martha Stewart Living’s Thanksgiving issue, which captivated me, especially this and another pie recipe for quince, a relatively rare and old-fashioned fruit that also captivates me. I buy local ones from Paul’s Orchard, which sells them at the Original Night Farmers Market in South Fayette. A fuzzy pale greenish yellow and still rock-hard when ripe, quince need to be cooked, but when they are, they turn a beautiful reddish orange, with a spicy sweet taste. The “slab” refers to this pie’s rectangular shape. I usually don’t bake with puff pastry, but the brand Martha recommends was easy to work with and delicious (my friend Patricia Lowry picked it up for me at Whole Foods). I’ll try this again and with other fillings. Make the filling: Bring wine, water, granulated sugar, butter, cardamom, cinnamon sticks, ginger and vanilla seeds and pod to a simmer in a large pot. Meanwhile, peel, core and quarter quinces, adding them to pot as you work. Cover with parchment, and cook until quinces are soft and rosy pink, about 2 hours. Discard vanilla pod. Cut dough in half lengthwise to form 2 6-by-15-inch rectangles. [I made my top piece slightly wider to accommodate the filling.] Using a slotted spoon, transfer quince onto puff pastry, leaving a 1-inch border. (There will be a small pool of liquid.) Brush border with egg wash. Top with remaining puff pastry, pressing edges to seal. Brush top with egg wash, and sprinkle with sanding sugar. Freeze until firm, about 15 minutes. Cut 6 2-inch slits every 2 inches along the top for steam vents. Bake until pastry is puffed and golden, about 45 minutes. Cut slab pie into triangular pieces. Serve immediately.